Ants have two eyes which are made up of many smaller eyes. These eyes are referred to as compound eyes. Ants are social insects, they live in colonies. A colony may have only a few dozen residents or it may have millions. There is a super colony in Australia, located beneath Melbourne. It is more than 100 km long. The super colony in California is more than 900 km long and the colony on the Mediterranean Coast is over 6 000 km long. There is another super colony in Japan that has approximately 306 million residents. The average life span of an ant is 45 to 65 days. The ant goes through four distinctive stages in its life, the egg, the larva, the pupa , and the adult. All ants have a specific function within the colony. There is a queen, workers, soldiers and the males. There may be more than one queen in a colony. The queens are born with wings but lose them shortly after mating. Workers are sterile, wingless females. They gather food, take care of the eggs, enlarge the nest and take out the trash. Ants have two stomachs. One stomach is for them, the other is used to transport food back to the colony. Males have wings. Their sole job is to mate with the queens. Ants are able to lift things 20 times their own weight. They are also incredibly fast runners in proportion to their size. 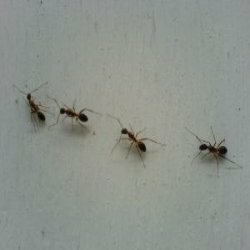 This entry was posted in Insect Trivia and tagged Ant, ant colony fatcs, ant colony trivia, ant information, Ant Trivia, Ant trivia fatcs, fun ant trivia, Fun ant trivia facts, Insect Trivia by Jane. Bookmark the permalink.